Doncaster Rovers have signed Swansea City defender Aaron Lewis on loan until the end of the season. The 20-year-old right back is yet to make his senior Swansea debut but has featured for their Under 21 side in the Checkatrade Trophy. Lewis has been with the Swans since the age of nine. He will provide defensive cover with Niall Mason, Joe Wright and Shaun Cummings all still sidelined. The Wales Under-21 international told Rovers’ official website: “I played a couple of times in the Checkatrade Trophy and trained through pre-season with the Swansea first team but now is the right time to get out and get some competitive games at a great club. “I’m really excited to get going. 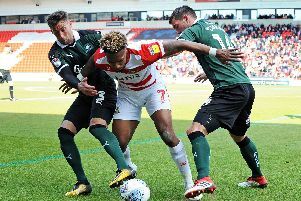 “Doncaster Rovers is a really good club that’s doing well so it’s a good opportunity to step up and hopefully push the club forward as much as I can. He added: “I know Herbie [Kane]. I spoke to him a few times and he said the boys here are really good, it seems like a good environment to come into. “He said they all work hard and are on a really good run, so it sounds like a really good club. Meanwhile, Luke McCullough has extended his loan stay at Tranmere Rovers until the end of the season. Alex Kiwomya will also remain on loan at Chesterfield until the end of the season, while Alfie Beestin has extended his stay at the Proact Stadium until mid-February.